Working as the stud to other successful horses in Albertas Run, Flagship Uberalles, According To Pete, Blazing Tempo, Finger Onthe Pulse and Shepherds Rest, Shutthefrontdoor has been another shining example of Accordion’s immense pedigree. Born in 2007, Shutthefrontdoor is one of several horses to be owned by John P McManus and trained by Jonjo O’Neill, who runs an advanced facility at Jackdaws Castle in Cheltenham. Holding a tally of nine wins, one second and two thirds from twenty-two entries into recognised races doesn’t boast of an utterly formidable record but winning The Irish Grand National in 2014 was enough to put Shutthefrontdoor in the history books. There was a sense of Shutthefrontdoor bursting onto the horse racing scene in 2011 when he won The Walters UK Ltd Standard Open National Hunt at Ffos Las, The Championship Standard Open National Hunt Flat Race at Ascot, and The Betfair Mobile For Best Prices Bumper at Newbury. Only reaching third in the EBF National Hunt Maiden Hurdle at Folkestone saw Shutthefrontdoor’s first defeat, but he responded immediately after with wins in the 32Red Maiden Hurdle at Uttoxeter, The Higos Insurance Services Ltd Crewkerne National Hunt Novices’ Hurdle at Wincanton, and The Pertemps Handicap Hurdle at Carlisle. Making his first entry into Cheltenham Festival saw Shutthefrontdoor only reaching fourth in The Pertemps Final, winning the Betfred Bingo Novices’ Chase at Aintree seven months later, but seeing more disappointment at Cheltenham Racecourse through a second place finish in The Roy Blandford 65 Years At Cheltenham Novices’ Chase, a fourth place finish in The Ryman Stationery Novices’ Chase, and a sixth place finish in The Terry Biddlecombe National Hunt Amateur Riders’ Novices’ Chase. It was at this point where Shutthefrontdoor stunned the horse racing world by winning the 2014 Irish Grand National at Fairyhouse, which was even more impressive after falling short in so many recent Cheltenham races. Following up his Irish Grand National victory with a win in The Weatherbys Bank Graduation Chase at Carlisle, it looked like Shutthefrontdoor would become a prolific horse capable of winning almost every race that he’s entered into. This changed immediately after when he only made it to fifth in The Aintree Grand National, failing to win a further seven races including another attempt at The Aintree Grand National in the following year. A poor record since 2015 hasn’t given much hope over future wins for Shutthefrontdoor, but that doesn’t stop a lot of horse racing punters from believing that we’ll see more success from the bay gelding in future years. This page is used to track the Jonjo O’Neill horse, with Shutthefrontdoor odds and information provided below as soon as he’s entered into any races. When is Shutthefrontdoor running next? Shutthefrontdoor ran his last race in 2017 and he hasn’t been entered into any races throughout 2018/19. We will provide details of his next race as soon as one is officially confirmed. 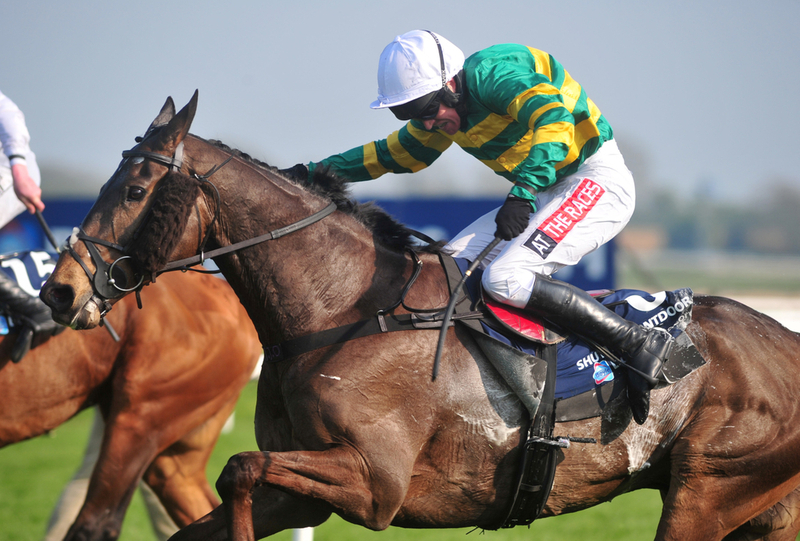 Featuring at Cheltenham Racecourse for the first time during the 2013 Cheltenham Festival, Shutthefrontdoor went into The Pertemps Final as second favourite, finishing fourth. He returned in The November Meeting, making it to second in The Roy Blandford 65 Years At Cheltenham Novices’ Chase, before appearing at The International in December, where he could only reach fourth in The Ryman Stationery Novices’ Chase. It was hoped that he could present a better showing in his second entry into Cheltenham Festival in 2014, but the sixth-place finish in The Terry Biddlecombe National Hunt Amateur Riders’ Novices’ Chase saw further disappointment. Missing out on the 2015 Cheltenham Festival wasn’t a massive surprise after such abysmal performances at Cheltenham races in the past but attempting to show his quality in 2016 saw him only making it to seventh in The Unicoin Group Handicap Chase, once again faltering on New Year’s Day when he pulled up in The Bet Bright Best For Festival Betting Handicap Chase.